This page provides information on what happens after a gift has been shipped, and useful contact information for you to use if required. 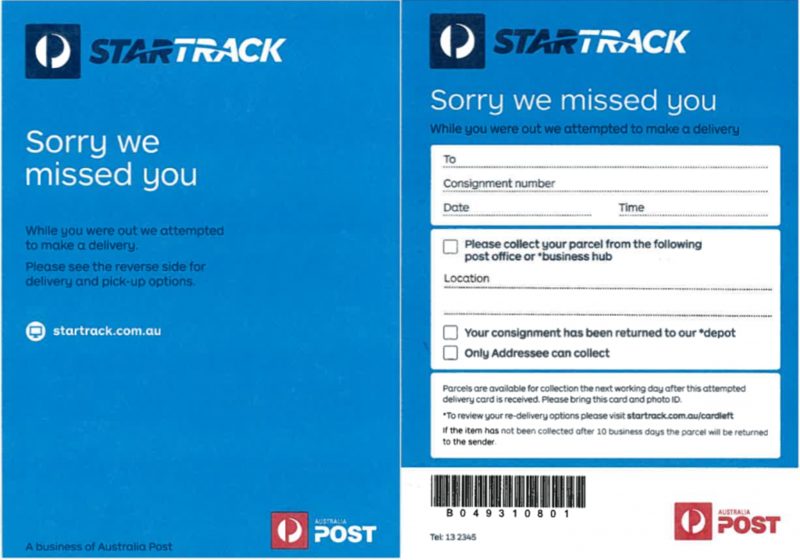 Startrack Express are used for all deliveries around Australia that are not Same-Day Sydney Express. How long will it take for my gift to arrive? Gourmet Baskets are shipped for delivery overnight to most city and metro locations, and may take 2-5 days for more remote areas, including regional state areas, the West Coast, or when the gift is classified as a "Large Gift" - as shown when you selected your shipping method. Gifts over 5kg (Large Gifts) are delivered Via Road Express and hence take longer for larger distances. What happens if no-one is home? Our couriers have Authority to Leave the gift if no-one is home, and there is a safe place to do so. A safe place includes hidden from view, out of the sun, etc. If the courier cannot find a safe place (eg: can't get into a locked Unit block) then they will not leave the gift. No signature is required upon delivery. If this happens, a Sorry we missed you card will be left, and the gift will be taken to the nearest Post Office. The card will advise which Post Office the gift can be collected from. You may receive a notification from Startrack advising this. Notifications are sent to our gift Senders (not Receivers) since you are our Customer. At this point, the gift cannot be redirected, and the recipient will need to go to the Post Office to collect. They will need some identification. You can contact Startrack Express on 13 23 45 and quote your Tracking ID (which is found in the emails sent to you from Gourmet Basket after ordering) if you wish to discuss your delivery directly. You can contact us at any time should you have further difficulties on 1300 354 393 during business hours Monday to Friday, or email service@gourmetbasket.com.au. The gift may be delivered, and potentially kept by the receiver at the wrong address. If this occurs there is nothing we can do as we don’t know who has the gift. The gift may be delivered, and the receiver may contact us to inform us they have it. Generally this would be someone close to the original address and they may be able to hand-deliver it. If not, it is possible to organise another courier, though the fee for that is not known until booking and would be chargeable. The gift is not delivered, and we are contacted by the courier. At this point we can have it re-directed to a new address – there will be a new Delivery Fee based on the delivery location. The courier company will contact us and the hamper will be returned. If you wish the gift to be re-delivered, a new shipping fee will need to be charged. If the hamper is not returned to us, we will assume is has been delivered and no refund is available. Go to https://startrack.com.au/ and click on Track and Trace. You will need your tracking number which would have been sent to you after your order was Packed, and again after your order was Delivered. If you would like our help please contact us at any time should you have further difficulties on 1300 354 393 during business hours Monday to Friday, or email service@gourmetbasket.com.au.